I recently came across the chart (sic) below on this web site. It’s apparently called the “graph of doom”. It first came to public attention in May 2012 in the UK newspaper The Guardian. 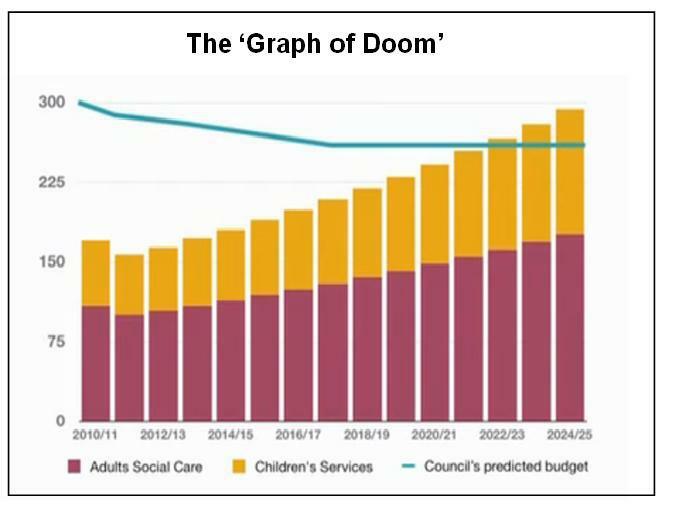 It purports to show how the London Borough of Barnet’s spending on social services will overtake the Borough’s total budget some time around 2022. At first sight the chart doesn’t offend too much against the principles of graphical excellence as set down by Edward Tufte in his book The Visual Display of Quantitative Information. The bars could probably have been better replaced by lines and that would have saved some expensive, coloured non-data ink. That is a small quibble. The most puzzling thing about the chart is that it shows very little data. I presume that the figures for 2010/11 are actuals. The 2011/12 may be provisional. But the rest of the area of the chart shows predictions. There is a lot of ink on this chart showing predictions and very little showing actual data. Further, the chart does not distinguish, graphically, between actual data and predictions. I worry that that might lend the dramatic picture more authority that it is really entitled to. The visible trend lies wholly in the predictions. Some past history would have exposed variation in both funding and spending and enabled the viewer to set the predictions in that historical context. A chart showing a converging trend of historical data projected into the future is more impressive than a chart showing historical stability with all the convergence found in the future prediction. This chart does not tell us which is the actual picture. Further, I suspect that this is not the first time the author had made a prediction of future funds or demand. What would interest me, were I in the position of decision maker, is some history of how those predictions have performed in the past. 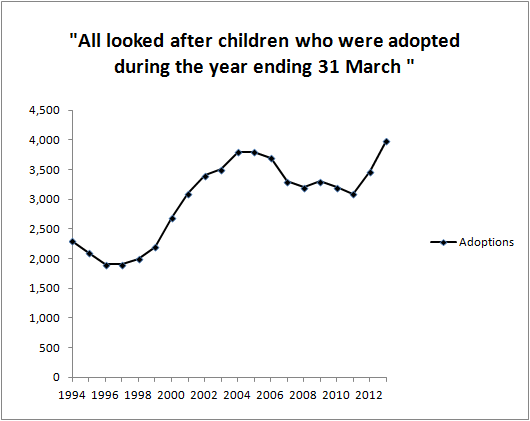 We are now more than one year on from the original chart and I trust that the 2012/13 data is now available. Perhaps the authors have produced an updated chart but it has not made its way onto the internet. 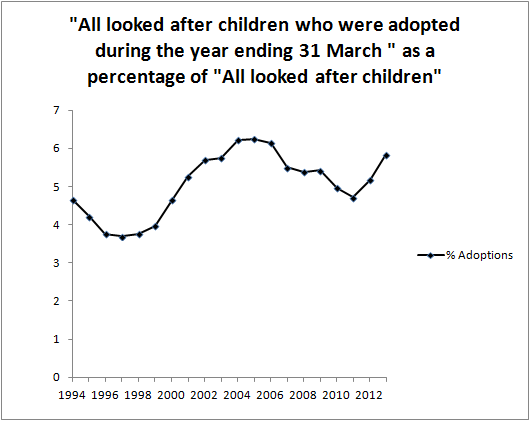 The chart shows hardly any historical data. Such data would have been useful to a decision maker. The ink devoted to predictions could have been saved. All that was really needed was to say that spending was projected to exceed total income around 2022. Some attempt at quantifying the uncertainty in that prediction would also have been useful. Graphical representations of data carry a potent authority. Unfortunately, when on the receiving end of most Powerpoint presentations we don’t have long to deconstruct them. We invest a lot of trust in the author of a chart that it can be taken at face value. That ought to be the chart’s function, to communicate the information in the data efficiently and as dramatically as the data and its context justifies. I think that the following principles can usefully apply to the charting of predictions and forecasts. Use ink on data rather than speculation. Chart predictions using a distinctive colour or symbol so as to be less prominent than measured data. Use historical data to set predictions in context. Update chart as soon as predictions become data. Ensure everybody who got the original chart gets the updated chart. Leave the prediction on the updated chart. The last point is what really sets predictions in context. Note: I have tagged this post “Data visualization”, adopting the US spelling which I feel has become standard English.